What he misses is that it is actually an obligation of the State to provide adequate reception facilities for asylum seekers. It is also an obligation of the state to respect, protect, and ensure the enjoyment of human rights for all residing in its jurisdiction, including all migrants and refugees. Three years after the EU-Turkey Statement, time has shown that the Greek state, and the European Union in its role implementing European migration policies, have utterly failed to meet these obligations. The horrible conditions and systematic procedural violations are not only morally, but legally unacceptable. The practices we have documented in the first quarter of 2019 demonstrate a continued policy of dehumanization, discrimination, and structural violence against migrants entering Europe via Lesvos. Below is just a sampling of the continuing violation of migrants we have repeatedly reported on. Two ways in which individuals are granted permission to leave Lesvos before their asylum claims are processed are if they are designated vulnerable (a legal designation under Law 4375/2016) or they are found eligible for transfer out of Greece through the Dublin III regulations. We welcome the fact that in 2018, 85% of asylum seekers in Lesvos were granted permission to leave the island on one of these bases. However, due to overcrowding in government provided housing for asylum seekers throughout Greece, the delay for being transferred off the island after permission to leave is granted can take several months, meaning that thousands of individuals who are recognized as vulnerable must remain in Moria Camp unless they are able to secure their own housing. Furthermore, those who use their own means to travel off the island, and secure their own housing, face further procedural obstacles. While many individuals we have been in contact with have attempted to register at the nearest asylum office after they have moved off of Lesvos, they have either been unable to access the asylum office, or officers at the nearest asylum offices have refused to transfer the individuals’ asylum cases to the nearest office, as is their right. This has meant that these individuals must return to Lesvos for their asylum interviews at their own expense (both travel back to Lesvos and accommodation in Lesvos). Failure to appear for an interview results in the interruption and closure of one’s asylum case, which has been practically impossible to reopen for many individuals, since 2018 amendments to the Greek Asylum Law require that the asylum seeker show “with specific evidence that the decision to discontinue was rendered under circumstances independent of the applicant’s own will.” Article 28 (8), Law 4540/2018. While individuals who have been designated vulnerable are currently not subject to being deported to Turkey, they are left without status, in a state of legal limbo. Furthermore, there is no guarantee that asylum interviews will take place on the date scheduled, and several individuals have reported to our office that they returned to Lesvos for their interview only to have it postponed. Case Study: An individual from Syria arrived in Lesvos in December 2017, and was arrested in March 2018 after being wrongfully accused of participating in a riot in Moria Camp. Despite the lack of any credible evidence against him, he spent a year in Greek prison in pre-trial detention, where he was re-traumatized as he had survived imprisonment and torture in Syria. In March of 2019, he and all other defendants were acquitted on all charges, and he was finally released from prison. His asylum interview was scheduled just a few weeks later, on the 27 March 2019. While he had limited access to medical care while in Greek prison, he was able to visit volunteer medical actors in the days before his interview. Suffering from months of insomnia and other symptoms as a result of his trauma and imprisonment in Greece, he was prescribed with sleeping pills and anti-depressant medication just the day before his interview. He also was assessed as to his vulnerability by a psychologist from KEELPNO (the public health service) the day before his interview, and had to recount to the psychologist the torture he had survived in Syria. As it was the first day he took this medication, and after months of not sleeping well, he did not wake up the next morning to his alarm. While he admittedly woke up later than he had planned, he managed to arrive at around 10:30am to the EASO office where his interview was to be held; an office 15 km outside of Moria camp and Mytilene, only to find out his case would be discontinued because he had missed his appointment. Through advocacy and representation of a Legal Centre lawyer, who demonstrated the individual’s previous trauma in Syria, his unjust imprisonment in Greece, and the provision of prescription medication just the day before his interview, his case was finally reopened on the 17 April, and he now awaits to be scheduled for an interview on his asylum claim. There are many individuals, however, who are not able to access legal aid, or who do not have specific evidence to support reopening their case after missed appointments. For several months, the Regional Asylum Office in Lesvos has required that those whose asylum cases are approved, to provide proof of residence in order to obtain a Greek resident permit, contrary to Article 24 of Law 4375/2016, which provides that it is an obligation of the competent Asylum office to provide individuals with resident permits if their cases are approved. The vast majority of those granted status in Lesvos are still living in Moria Camp, however, RAO will not issue IDs to these individuals, requiring instead that individuals provide a rental contract for housing outside the camp. This arbitrary requirement, which was not required in the past and is not required from other Regional Asylum Offices in Greece, is a practical impossibility for most individuals and denial of IDs perpetuates the marginalization and exclusion of these individuals from political and civil society. The Legal Centre has represented an increasing number of individuals applying for reunification with close family members outside Greece under Dublin III regulations. While in past years, copies of identification documents showing family links were sufficient, increasingly the Dublin Units of Third European Countries, in particular Germany, have required individuals to provide translation of documents and DNA evidence, and have required the advocacy of lawyers in order for claims to be approved. European regulations, and Greek law provide that it is the obligation of the state to translate any supporting documentation (Law 4375/2016, Article 41). However, we have documented several cases where the German Dublin Unit has required translation of documents before accepting them as evidence in support of claims. Case Study: A couple from Afghanistan with a sixteen year old daughter in Germany arrived in Lesvos in February 2018. The couple applied for family reunification under Dublin III regulations in order to join their daughter, who is unaccompanied and living with a state appointed guardian in Germany. They submitted government issued documents and family photos in order to prove the family relationship, and received written letters of support from both their daughter and her guardian. The Greek Dublin Unit recognized the couple’s right to join their minor daughter, and sent a “take charge” request to Germany in May 2018. In June 2018, their daughter’s asylum case was approved in Germany and she was granted refugee status, however, the same month, the Germany Dublin Unit rejected her parents request to join her, stating that they needed an English or German translation of documentation showing the family relationship, and further proof of the relationship. In July 2018, with representation of the Legal Centre and support of the Greek Dublin Unit, the couple requested the reexamination of their request to join their minor daughter, and requested a DNA test in case the documentation submitted was considered insufficient. Because of bureaucratic delays, and a second rejection of the take charge request by Germany, the DNA test samples were not taken and compared until January 2019, nearly six months later. The DNA test confirmed the family relationship and in March 2019, Germany finally accepted that the couple had the right to join their minor daughter in Germany. To date, the couple awaits to be reunited with their child, over a year after arriving in Greece, and nearly a year after the Greek Dublin Unit recognized their right to join their daughter. Greece continues its discriminatory practice of detaining upon arrival individuals based on nationality in Lesvos. While the number of detainees in Lesvos has decreased, this is mainly due to the change in demographic of arrivals in 2019 – the vast majority are Afghan nationals who are not subject to detention on arrival. For those detained, practices are often changed without notice or justification. In January, after one individual escaped from detention, all detainees were denied access to their phones, and lawyers, including from the Legal Centre, were denied access to clients in detention for several days. 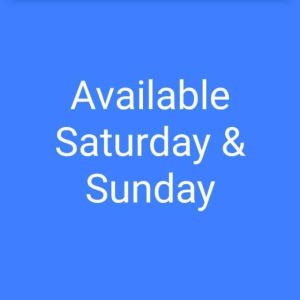 While in the past detainees had access to their phones throughout the week, currently, detainees are only granted access to their phones on Saturdays and Sundays. Most deportations to Turkey are carried out on Thursdays, meaning that individuals subject to deportation who learn that they are scheduled for deportation only hours before the detention, are unable to communicate with family, friends, or lawyers prior to their deportation. WhatsApp profile photo of individual detained in Moria detention centre, as they are only able to access their phones on Saturday and Sunday. There have also been reported cases of the deportation to Turkey of individuals who have not had their claims heard in Greece. One Senegalese national, who through an attorney had notified the police and asylum office of his intention to file a subsequent application for asylum was deported to Turkey before this claim was considered. On 5 April, over one thousand migrants and refugees gathered in protest in Northern Greece outside of Thessaloniki in Diavita, and in the Larissa train station in Athens, with the stated intention of attempting to cross the northern border of Greece. 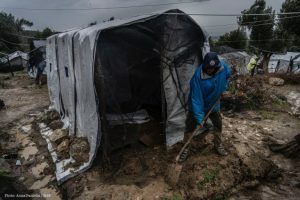 Following an announcement in early 2019 by the Ministry of Migration that recognized refugees would lose state benefits – including cash assistance and housing – migrants and recognized refugees throughout Greece have mobilized, and the recent incidents are not isolated. Contrary to reports that these protests were the result of “fake news” that the borders would open, most migrants know very well that European policies have maintained the borders closed for the past three years, but they gathered in protest in response to these hostile policies of marginalization and exclusion. Predictably, they were met with extensive police violence, and they were prevented from moving north. Freedom of movement was also restricted as the Migration Ministry’s Regional Coordinator cancelled all trains from Athens to Thessaloniki until the mobilization was forcibly dispersed. On 16 April, in a strike organized by the Trade Union of the Employees in Non-Governmental Organizations, and joined by Legal Centre attorneys, NGO workers demonstrated in Athens against the same announced plan to terminate accommodation and financial aid to refugees who have received a positive response to their asylum application. Since August of 2016, the Legal Centre has operated on principals of nondiscrimination, support for migrant movements, and in recognizing and advocating against exclusionary polices of the EU and Greece. We have not compromised these positions to secure funds, and have limited our funding from individuals and donors with a similar ethical standing as our own in order to maintain our independence. We are proud that our political positions have been recognized by partners and funders alike. In 2019, we secured increased support from La Garriga Societat Civil and Fons Catala. Additionally, in March 2019 Fundacion Heres has renewed its support for the Legal Centre, for a limited time period. Because of this support, we are now able to recruit for a fundraising position, in order that we can ensure the continued and sustainable presence of the Legal Centre in Lesvos. 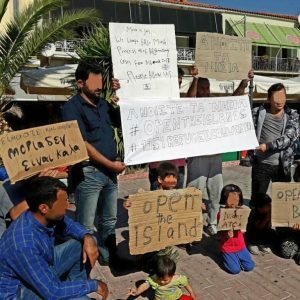 In other funding news, the Mosaik Support Center and Lesvos Solidarity – Pikpa are going through funding crisis and need your help. Since we started working on the island, the Legal Centre has been hosted in Mosaik Support Centre, which provides a space of warmth, safety and community for the most vulnerable populations on Lesvos. Over the past two and a half years, we have been proud to be a part of this community formed at Mosaik Centre. Please see the linked statement and share with your networks in order to secure sustainable future of Mosaik Centre and Lesvos Solidarity. 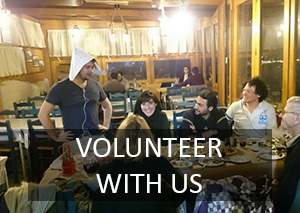 The Legal Centre is hiring a fundraiser to based with our team on Lesvos island in Greece. For more details, see the announcement, linked below. Application deadline 15 May 2019. A fourth trial against refugees who have been protesting on the central square of Mytilene will follow. The hearing date is the 9th of May 2019. The group has been arrested on the night of 22/23rd of April 2018. They were peacefully protesting against the situation on Lesvos, when they were attacked by a group of about 300 right wing nationalist with Molotov Cocktails, rocks, sticks, and bottles. 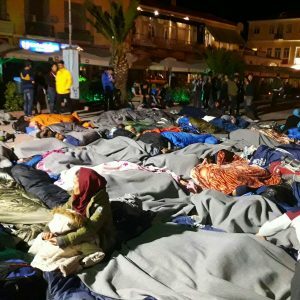 Until the early morning, the refugees were trapped on the square. While the violent attack took place, and after the violence came to an end, the police did not follow the aggressors but instead turned to the refugees who had been targeted by fascists for hours and took them to the police station. The public prosecutor’s office presses charges against them for the attempt to occupy public space, disobedience and resistance. When they tried to return to the square the next day, they were surrounded by police and harassed by hostile local groups. The police aggressively pushed the refugees aside, surrounded them and evicted the square. During this action, some of the protesters were hurt by the police, including a young child. While the refugee protestors were violently expelled from the square by the police, they did not engage in any violence themselves. More than a year later, 17 of the protestors of the Sapphous square events are now facing a trial in court. They were not even officially notified. Most of them have already been recognized as refugees, some live in Athens in the self-organized place “Hotel City Plaza”. The charges against them include camping on a public space, disobedience and resistance against the police. The court dates in Lesvos are the 21st and the 28th of February. We demand freedom for all accused protestors. The only “crime” they committed is demanding their legitimate rights to be allowed to move freely within Greece instead of being forced to live in the inhumane conditions of the European Hotspot camp Moria. The situation in Moria has been evolving as a result of the EU-Turkey statement that forces asylum seekers to remain on the Greek Islands. A member of Doctors without Borders described Moria as “the worst refugee camp in the world”. We stand in solidarity with all of the accused people. Three days later, eight individuals – four Iraqis and four Syrians – were arrested and charged for endangering human life. The police bases the arrest warrant on the accusation of a single person, an inhabitant of Moria camp who had at that time the function of a community leader for migrants from Iraq. On Thursday 24 January 2019, Sohel M. will appear for preliminary hearings after being indicted on felony charges relating to a fire in Moria Detention Centre in October 2016. At this hearing the judge will decide what criminal charges to prosecute against Sohel, and whether he will be freed from detention awaiting trial – which could be several months from now. Sohel has been a politically active and public figure in Lesvos for the last two years. It defies logic why more than two years after this specific fire in Moria – in which no one was injured – the Greek state has decided to invest resources to prosecute a case that has no basis. To anyone who knows Sohel in Greece it comes as no surprise that he was politically active in his home country of Bangladesh. Since his arrival in Lesvos, Sohel has publicly spoken out and organized for the rights of migrants. 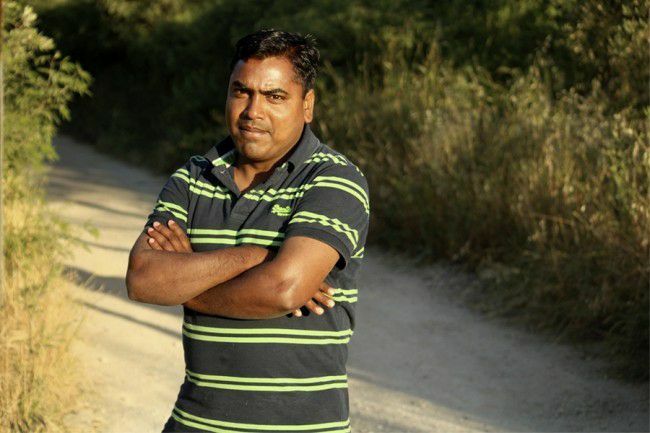 In an environment in which discriminatory practices breed tensions between different nationalities in Moria Camp, Sohel has always worked to bring communities together. Over the past two years, he has presented letters to European politicians, spoken to international press, met with parliament members, and participated in peaceful demonstrations. He has consistently worked together both with migrant and Greek communities to defend the rights of migrants. 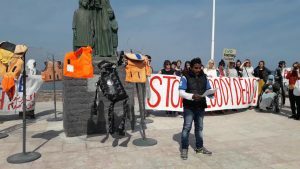 Organizing is not a crime, and demonstrating against inhumane conditions and unjust asylum procedures are not crimes – and these are the only activities Sohel has been involved in on Lesvos. Sohel has been living in Greece since July of 2016. Arriving just a few months after the EU-Turkey deal was implemented, he has been restricted for this entire time to the island of Lesvos, living most of this time in the notorious Moria Camp. While Sohel had personally faced persecution for his political activities in his home country (and fatal political infighting is common in Bangladesh), his asylum claim, like those of most Bengali nationals, was rejected. He now faces baseless criminal charges. The injustice Sohel has faced since he arrived in Europe is the only crime in this case. Την Πέμπτη 24 Ιανουαρίου 2018, ο Σοχέλ M. θα εμφανιστεί σε προκαταρκτική ακρόαση αφού αντιμετωπίζει κατηγορίες κακουργηματικού χαρακτήρα σχετικά με πυρκαγιά στο Κέντρο κράτησης της Μόριας τον Οκτώβριο του 2016. Σε αυτή την ακρόαση ο δικαστής θα αποφασίσει ποια ποινική δίωξη θα ασκήσει εναντίον του Σοχέλ και εάν αφεθεί ελεύθερος εν αναμονή της δίκης, η οποία θα γίνει σε αρκετούς μήνες από σήμερα. O Σοχέλ τα τελευταία δύο χρόνια υπήρξε πολιτικά ενεργός και δημόσιο πρόσωπο στη Λέσβο . Αμφισβητεί τη λογική γιατί για περισσότερο από δύο χρόνια μετά από αυτή τη συγκεκριμένη πυρκαγιά στη Μοριά – στην οποία κανείς δεν τραυματίστηκε – το ελληνικό κράτος αποφάσισε να επενδύσει πολιτικά σε μια υπόθεση που δεν έχει καμία βάση. Ενώ η ακρόαση θα είναι ιδιωτική, καλούμε για αλληλεγγύη στον Σοχέλ την Πέμπτη 24/01/19 και ώρα 12:00 στο Δικαστικό Μέγαρο Μυτιλήνης. Για όποιον γνωρίζει το Σοχέλ στην Ελλάδα, δεν αποτελεί έκπληξη το ότι ήταν πολιτικά ενεργός στην πατρίδα του στο Μπαγκλαντές. Από την άφιξή του στη Λέσβο, ο Σοχέλ μίλησε δημοσίως για τα δικαιώματα των μεταναστών. Σε ένα περιβάλλον στο οποίο οι πρακτικές που εισάγουν διακρίσεις δημιουργούν εντάσεις μεταξύ διαφορετικών εθνικοτήτων στο καμπ της Μόριας, ο Σοχέλ εργάστηκε για να φέρει μαζί τις κοινότητες. Κατά τα τελευταία δύο χρόνια, παρουσίασε επιστολές σε ευρωπαίους πολιτικούς, μίλησε στο διεθνή Τύπο, μέλη του Ευρωπαϊκού Κοινοβουλίου και συμμετείχε σε ειρηνικές διαδηλώσεις. Έχει εργαστεί ενεργά με μεταναστευτικές και ελληνικές κοινότητες για την υπεράσπιση των δικαιωμάτων των μεταναστών. Η αυτοοργάνωση δεν είναι έγκλημα και η κατάδειξη των απάνθρωπων συνθηκών και των άδικων διαδικασιών ασύλου δεν αποτελούν εγκλήματα, αυτές είναι οι μόνες δραστηριότητες που ανέλαβε ο Σοχέλ στη Λέσβο. Ο Σοχέλ ζει στην Ελλάδα από τον Ιούλιο του 2016. Έφτασε μόλις λίγους μήνες μετά την υλοποίηση της συμφωνίας ΕΕ-Τουρκίας και έχει περιοριστεί όλο αυτό το διάστημα στο νησί της Λέσβου, που ζει το μεγαλύτερο μέρος αυτής της περιόδου στο περιβόητο καμπ της Μόριας . Ενώ ο Σοχελ αντιμετώπισε προσωπικά διωγμούς για τις πολιτικές του δραστηριότητες στην πατρίδα του (οι θανατηφόροι πολιτικοί αγώνες είναι συνηθισμένη υπόθεση στο Μπαγκλαντές), το αίτημα ασύλου του, όπως και εκείνων των περισσότερων Μπενγκάλι, απορρίφθηκε. Τώρα αντιμετωπίζει αβάσιμες κακουργηματικές κατηγορίες. Η αδικία που αντιμετώπισε ο Σοχέλ από τότε που έφτασε στην Ευρώπη είναι το μόνο έγκλημα σε αυτή την περίπτωση. Sohel participating in demonstration in Mytilene in January 2017, after several people died from the cold in Moria Camp. Η περιοριστική πολιτική σχεδιάστηκε και δικαιολογήθηκε ως ένα μέσο υλοποίησης της συμφωνίας ΕΕ–Τουρκίας του Μαρτίου 2016, που προέβλεπε την επιστροφή στην Τουρκία των αιτούντων/ουσών άσυλο που έφταναν στα ελληνικά νησιά διασχίζοντας την θάλασσα, ώστε τα αιτήματα ασύλου τους να εξεταστούν εκεί. Οι οργανώσεις δήλωσαν ότι η πολιτική αυτή επιβάλλει μια αδικαιολόγητη και περιττή ταλαιπωρία στους αιτούντες/ούσες άσυλο, ενώ περιορίζει αδικαιολόγητα το δικαίωμά εξέτασης των υποθέσεών τους κατά περίπτωση – αντί της κρίσης επί της «παραδεκτότητας». Η επιτάχυνση των επιστροφών, ένα μέτρο που προβλέπεται από την συμφωνία, δεν θα επέλυε την κρίση στα νησιά. Πολλοί/ες από όσους/ες βρίσκονται παγιδευμένοι/ες στα νησιά προστατεύονται από την επιστροφή τους και δεν θα μπορούσαν να σταλθούν πίσω στην Τουρκία, σε άλλες τρίτες χώρες ή στις χώρες καταγωγής τους, σύμφωνα με το ευρωπαϊκό δίκαιο. And while freedom from unjust imprisonment is one thing, freedom in any broader sense is a different matter. The legal status of all 35 men is precarious. 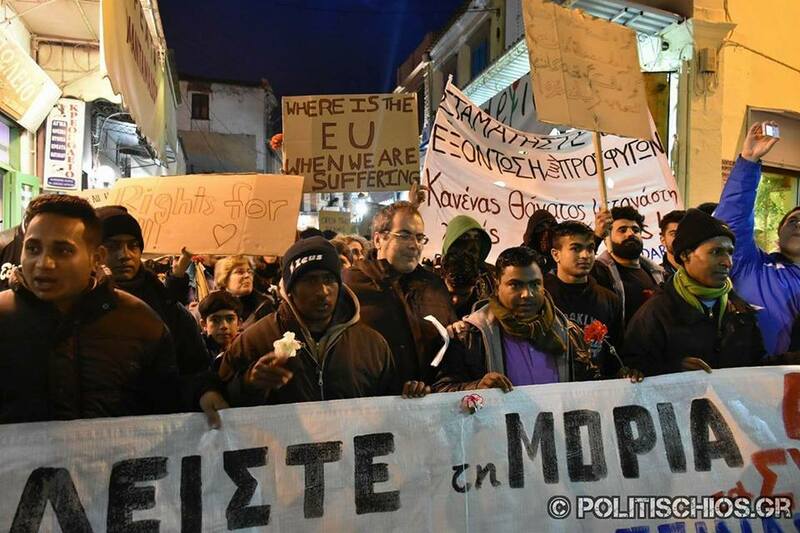 Six of them have been granted asylum in Greece, but the majority are now fighting the rejection of their asylum cases; on appeal or through subsequent applications which are subject to admissibility. Three individuals have been deported. One individual was illegally deported without having exhausted his legal remedies in Greece, while another individual, having spent 9 months in pre-trial detention only to be subject to a gross miscarriage of justice at criminal trial, signed up for so-called ‘voluntary’ deportation. Despite an abject lack of evidence against any of them, 32 of the Moria 35 were convicted of the crime of Dangerous Bodily Harm against police officers in grossly unjust criminal trial proceedings that took place in Chios in April 2018. Although their criminal conviction is being appealed, these men now live under the shadow of 26-month suspended prison sentences. By contrast, despite numerous videos, reports and eyewitness testimonies evidencing brutal police violence against the Moria 35, the public prosecutor decided to closed its investigation into police brutality in June 2018. Their basis for closing the investigation was that any use of force on the part of the police was justified, because the Moria 35 had resisted arrest. This despite the fact that all 35 men had just been found innocent on the charge of resisting arrest. From the Greek police’s brutally violent, racist mass-arrest of these 35 men; through the grossly unjust, punitive criminal procedure that they were subject to; to their release from pre-trial detention in April only for the majority to be transferred directly into immigration detention in Moria; the case of the Moria 35 over the past 15 months constitutes a catalogue of the forms of institutional racism and gross human rights abuses with impunity that are enabled by the intersection of violent immigration and criminal justice systems in Europe. The following timeline sets these out to the best of our knowledge, with links to more detailed reports. At approximately 10:00 on Tuesday 18th July 2017, refugees of different nationalities gathered in Moria for the second day in a row of peaceful protests, denouncing inhumane living conditions and demanding the right to freedom of movement for everyone trapped in Lesvos. The protest remained peaceful and calm until police arrived at around 13:00 and began to use tear gas. Many refugees were trapped outside the camp, some were trapped inside, there was confusion and inside Moria there were clashes between a handful of protesters and police officers shooting teargas and throwing rocks. By 15:00 the camp was calm. However, at approximately 16:00 several dozen riot police who had just arrived on the scene entered Moria and violently raided the African section of the camp. They pulled people out of the iso-box containers they lived in, brutally assaulted seemingly anyone they encountered including a pregnant woman, and by 16:15 had made 35 arrests. 34 of the 35 individuals arrested were black. One of the arrestees was urgently hospitalized due to severe injuries sustained at the hands of arresting officers. Interrogations by the Investigating Judge took place over the course of two days. Four of the Moria 35 had this procedure postponed due to the state’s inability to produce translators in their languages. The procedure was also postponed for the individual who remained hospitalized. There were solidarity protests outside the courthouse on both days. Many of the 35 arrested had not even been present at the morning’s peaceful protest, let alone the clashes between a small number of protesters and riot police that ensued following the police’s excessive use of tear gas. This led witnesses to conclude the arrests were arbitrary: that people were targeted because of race, nationality, and location within the camp at the time of the police raid; which itself seemed intended to collectively punish refugees for organised, peaceful resistance. 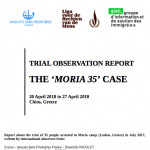 There was an absolute lack of evidence against any of the Moria 35. However, despite all this, the 30 individuals who were interrogated by the Investigating Judge were formally indicted on the catalogue of exaggerated crimes detailed above and the case was referred to trial. Many still had visible injuries and their access to food, water and medical care had been limited. Given the 48-hour window between arrests and preliminary inquiry, and the lack of lawyers on Lesvos, all 30 defendants were represented by one lawyer from the Legal Centre. 12 of the defendants filed official complaints in court against the police for excessive use of force. Many had vulnerability status and/or serious mental and physical health conditions that should have precluded pre-trial incarceration, which in any case should be a matter of last resort under both Greek and International law. Yet pre-trial detention was ordered for all 30 men pursuant to Article 282 of the Greek Code of Criminal Procedure due to the gravity of the charges and their deemed lack of appropriate address, despite all being registered residents of Moria camp. Amidst misinformation, lack of translation and defendants’ reports of police intimidation and racism, the 30 individuals for whom pre-trial detention had been ordered were transferred from Lesvos and divided between a prison on the island of Chios, and Korydallos and Avlona prisons in Athens, which were ill equipped to deal with non-Greek speakers and made visits from friends, family and lawyers extremely difficult. Immediately upon being discharged from hospital, the individual hospitalized for a week due to police violence faced the investigating judge. Though indicted with the same charges, he was not given a pre-trial detention order and was released pending trial – though confined to the island of Lesvos with reporting conditions. The right to free trial under the European Convention of Human Rights (ECHR) makes it an obligation on the state to provide translation in a language a defendant understands. However, given the Greek state’s continued failure to do so in the case of 4 of the Moria 35, by the end of September, the Wolof-speaking defendant himself produced a translator and was interrogated by the Investigating Judge. By November, the 3 Bambara-speaking defendants had done the same. Thanks to arguments from the defense team coordinated by the Legal Centre and HIAS, regarding residency in Moria, health conditions, and the fact that these men had duly showed up to court once a month for as long as the state had failed to produce appropriate translators, the 4 defendants were released with restrictive conditions pending trial. All 5 defendants – including the individual hospitalized by police violence – who had been given restrictive measures were forced to remain within the open-air prison of Lesvos, and to live in Moria camp: the very place they had been subject to brutal police violence. Despite applications for release on the basis of severe health conditions being made by defense lawyers, the Municipal Court renewed the pre-trial detention conditions for 30 defendants for a further 6 months. There was no legal basis for denying the 30 defendants their right to liberty and presumption of innocence (Article 5 and Article 6(2) ECHR) by ordering pre-trial detention to begin with, particularly given that none of the defendants had previous convictions and the prison-like character of the island of Lesvos itself precludes flight. Pre-trial detention is disproportionately used against foreign national defendants in Greece. Renewing such pre-trial detention was unduly harsh and unlawful. The trial date had still not been announced. The trial date was finally set for 20 April 2018, before a ‘mixed jury Court’ in Chios. There was no apparent explanation for authorities’ decision to move the trial of the Moria 35 to the island of Chios: away from the solidarity groups that had been supporting them and the many witnesses to the events on the day of their arrest present in Lesvos. The five members of the Moria 35 under restrictive measures on the island of Lesvos released a collective statement ahead of their trial. “Our humanity has been denied since we stepped foot in Europe, the supposed cradle of democracy and human rights. Since we arrived we have been forced to live in horrible conditions, our asylum cases are not taken seriously, and most Africans are denied residency in Europe and face deportation. We are treated like criminals, simply for crossing a border that Europeans can freely cross. 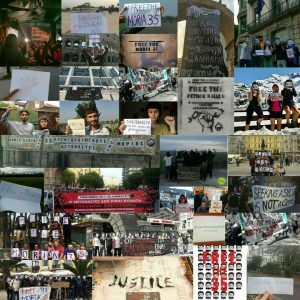 In the week running up to the Moria 35 trial there were events, protests and documentary screenings in solidarity with the Moria 35 across Europe, using the hashtag #FreetheMoria35. The mobilisations in Greece linked the case of the Moria 35 to the case of the Petrou Ralli 8, which was on trial the week after the Moria 35 and which shared many characteristics: refugees detained in inhumane conditions in a notorious detention centre peacefully raising questions in protest at their conditions, a police response of brutal violence causing serious injury (broken bones, head injuries), followed by seemingly arbitrary arrests, indictment on a catalogue of extreme criminal charges, and dispersal across prisons in Greece for unlawfully lengthy periods of pre-trial incarceration. These cases were also linked to a further analogous case known as the ‘Moria 10’, which involved 10 individuals indicted for clashes in Moria one week before the Moria 35 arrests. 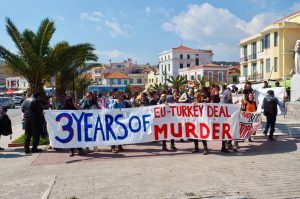 The patterns of state violence and institutional racism in these cases, which shared similar timelines, were seen as evidencing the systematic nature of repression and criminalization of migrant resistance to border violence in Greece. The Committee found the treatment of the Moria 35 defendants to breach the prohibitions of inhumane treatment under Article 3 ECHR. During the trial the defendants were given no breaks when they had to go to the toilet the trial continued without them. They were not provided with food by the authorities during the duration of each long trial day. The disproportionate 9 month delay that the Moria 35 were subject to between arrests and trial constituted a breach of Article 6(1) of the ECHR, particularly given that 30 of them were subject to detention conditions which should entail prioritization. The Greek state systematically failed to provide competent interpreters in a language the Moria 35 defendants understood. This was the case from the preliminary inquiry and through the course of proceedings at trial. At no point were any of the defendants ‘informed promptly, in a language which he understands and in detail of the nature and cause of the accusation against him’ Article 6(3)(a) and Article 5(2) ECHR. At the trial stage, none of the defendants were accorded their right to ‘have the free assistance of an interpreter if he cannot understand or speak the language used in court’ as per Article 6(3)(e) ECHR. Translation was grossly inadequate throughout proceedings. It was not individual: there was, for example, one translator for 20 French-speaking defendants; and it was not competent: none of the interpreters were trained or professional. At one point in proceedings the English translator left and was replaced by a police officer. There was no Bambara translator provided for the Bambara-speaking defendant, who was expected to understand the Wolof translator, himself a refugee, despite not speaking Wolof. Lack of translation restricted defendants’ other rights under the right to free trial, such as their ability to present their case, equality before the law and equality of arms. These rights under Article 6(1) ECHR were further violated at trial by the shockingly limited amount of time each defendant was given to present their testimony. The president of the court only asked three questions of each of the 35 defendants and prevented them from saying more. Despite letting the prosecution witnesses speak for 45 minutes each on average, each of the 35 defendants was only given an average of 7 minutes to speak. Some spoke for only 3 minutes. Given that all 35 defendants faced maximum prison sentences of 10 years, and that half of the minutes they were permitted were taken up with translation; this was deeply unjust. In addition, the 35 defendants shared 6 lawyers. Each lawyer was limited to 11 minutes for the multiple clients they were representing. This amounted to an average of 108 seconds of legal defense per defendant. The report also evidences breaches of the presumption of innocence under Article 6(2) and impartiality of the tribunal per Article 6(1) ECHR stemming from the fact that there was no prosecution case against individual defendants. Evidence on individualized circumstances and alibis was not permitted. Prosecution witnesses could produce no proof of the involvement of individual defendants. In the verdict, defendants were not mentioned individually. Instead the Moria 35 were treated throughout proceedings as a “guilty group”. Such treatment as a “guilty group” also goes to breaches of the prohibition of discrimination under Article 14 ECHR. The Committee report raises concerns that the police raid of solely the ‘African section’ of Moria despite individuals of various nationalities having participated in protests was racially biased. Official guidelines for identification and recognition of suspects were not followed. The report cites evidence of racist remarks made by the police during arrests: “black dog”, “this is not Africa”; and racist remarks made by police officers giving evidence at trial: “they all looked much the same”. In its conclusion, the Trial Observation Committee report states that “The 35 defendants were not treated in the way other defendants are treated before the Greek courts, or in the way the ECHR specifies that defendants should be treated in Europe”. Following the trial, 5 individuals who had been in prison in Avlona were transferred to Petrou Rally in Athens. 25 were transferred directly to detention in Moria, and the 5 who had been confined to Lesvos awaiting trial traveled back to the prison-like island of Lesvos. The Legal Centre took on the representation of the men in their asylum cases, with some support from HIAS. Only the 4 individuals among the Moria 35 who had been granted refugee status were freed from incarceration. All others were transferred from penal detention to administrative detention, with recommendations for their continued detention as asylum seekers because they were seen as a threat to public security, despite the fact that the court had granted suspended sentences for all individuals convicted. The 7 individuals among the Moria 35 whose cases had been rejected on appeal were scheduled for deportation on 10th May. This despite the fact that: two of them had been denied legal representation on appeal, which is a right under Article 44(3) of Greek law 4375; none of them had exhausted their legal remedies; their criminal convictions were being appealed; and all of them had claims to residence permits on humanitarian grounds as victims and/or important witnesses to a serious crime (police brutality) that was the subject of ongoing proceedings, as per Article 19A of the amendments to Greek Law 4521 detailed in Law 4332. However, the deportations of all 7 men were halted at the last minute thanks to a mobilization of the Legal Centre, the Free the Moria 35 campaign, interventions of the Ombudsman office and the UNHCR, and petitions to file subsequent asylum applications being made by the legal team. Having spent 9 months incarcerated only to be subject to a gross miscarriage of justice, one of the Moria 35 gave up on the Greek ‘justice’ system altogether, signed for ‘Assisted Voluntary Return’ and was deported to Turkey. Another 2 of the Moria 35 were deported to Turkey on the morning of 13th June. Both men were had not exhausted their legal remedies in Greece. One individual was deported on this day despite still having the legal recourse of appealing in administrative court open to him. He had received new evidence in the form of original documents corroborating his claim for asylum or subsidiary protection. The other individual had been declaring his express desire to exercise his right to appeal the rejection of his asylum claim to police for days preceding his deportation. Lawyers had also spoken to the police department informing them of their intention to submit an appeal to the asylum service on his behalf. Yet despite this, both men were deported to Turkey and within a few weeks to their home countries. Despite the fact that all of the Moria 35 had been found innocent on the charge of resisting arrest, and despite extensive evidence of police violence; in June the public prosecutor closed the investigation into the police brutality that took place on 18th July 2017, on the basis that there was a lack of evidence, and that the individuals who had submitted claims against the police had been resisting arrest so the police’s use of force was necessary. In the months that followed the trial, 16 of the Moria 35 were gradually released. All of the individuals released within a year of their initial arrest still had pending asylum cases, either at first instance or on appeal. The 7 who remained incarcerated had cruelly had their imprisonment due to criminal proceedings seamlessly substituted for imprisonment due to asylum proceedings: one man whose case had been closed while he was in prison and unable to reopen it, and 6 who had been rejected at second instance, but had submitted subsequent applications. One of the Moria 35 was finally released, on his asylum case finally being reopened. The Legal Centre Lesvos will continue to document the institutionalized racism, impunity and gross human rights violations associated with this case, and to fight for justice for the Moria 35. The criminal convictions of 32 of the Moria 35 have been appealed. At the time of writing an appeal date has not yet been given. Earlier in the year a delegation of lawyers and jurists from Avocats Sans Frontières (France), Gisti (France), Migreurop (France), European Democratic Layers (The Netherlands), Dutch League of Human Rights (The Netherlands) and the Haldane Society of Socialist Lawyers (UK), attended the trial of the ‘Moria 35’, which ended with the conviction of 32 of the 35 defendants for dangerous bodily harm. Serious concerns have since been raised regarding the way in which the trial was conducted, with numerous human rights violations being identified by the observers present.